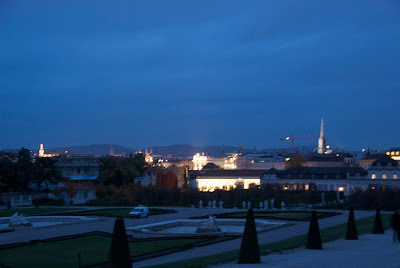 towards the Lower Belvedere Palace. Prince Eugene was fond of exotic plants. to be tinted indigo blue. 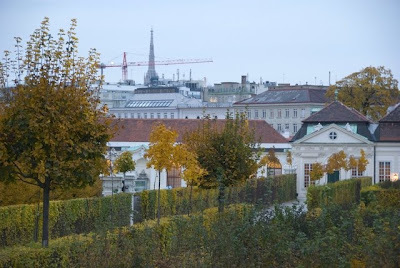 I had hoped to be able to get to the Belvedere in time for the Golden Hour, but when I finally was free to go there, the sun was already disappearing behind the buildings. Still, it was a wonderful evening walk. 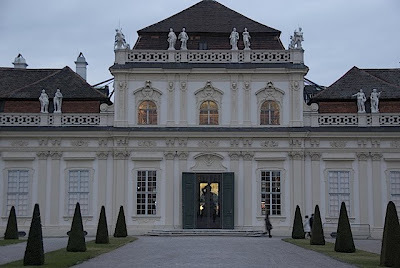 It took more than hour to walk from the Upper Palace to the Lower one, crisscrossing the gardens, and then back up again. I set my camera at ISO 400, the light was poor and I don't carry a tripod (would I ever! ), and captured whatever the available light would still allow me to. I arrived at the Belvedere all tired and exhausted. After the hourlong walk I felt refreshed and ready to brave the evening. Such is the power of beauty around you! Such a sense of graceful order to this architecture . . . and the blue hour is a lovely time. Wow, I love that Creeper. 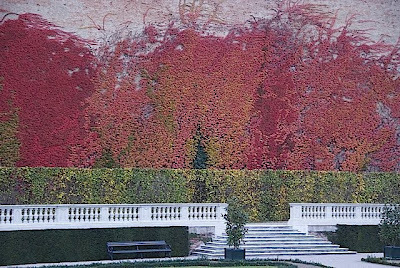 More beautiful photos--you gotta' love Virginia Creeper, too, eh? So brilliant. I'm drooling, imagining the walk you took, the beautiful gardens and statues. Eugene Savoy, was he related to the Italian King Emmanuel? 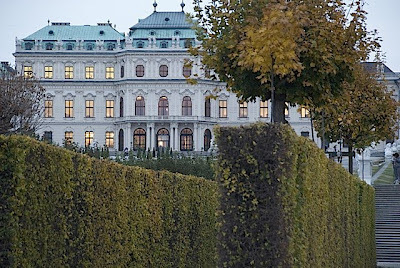 Isn't there a Belvedere Palace/Gardens on Lake Como too? Lovely!! Love the fall colors of the Virginia Creeper!! enJOY your day!! 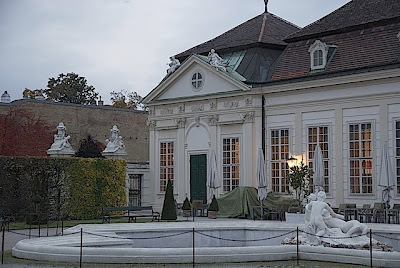 I've never been to the Belvedere, but now I wish I had gone when I had the chance. Thanks for the beautiful pictures! What a wonderful building! Very great photos! Beautiful. 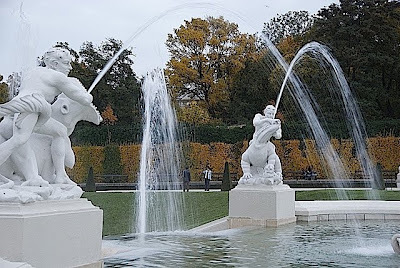 A Viennese Versailles. And I love the term "The Blue Hour"--so evocative. Thank you for these lovely photos & descriptions. 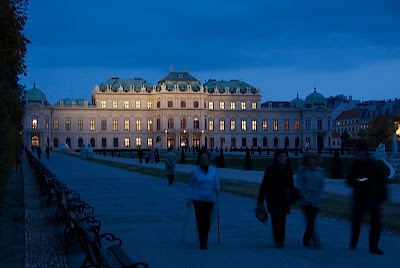 Love the evening shot of Schloss Belvedere! It just does not seem right, these photos.